ASTRO, San Antonio, Texas · 2018, S. Bonvalot et al. A subset of soft tissue sarcoma (STS) patients achieve significant therapeutic benefit from preoperative radiotherapy (RT). Yet, this treatment paradigm may be associated with limited efficacy and increased toxicity, highlighting the necessity of novel multimodal therapies aimed at local control with few adverse events (AEs). NBTXR3 is a first-in-class Hafnium-Oxide nanoparticle. Designed for cancer cell uptake, it is injected intratumorally (IT) and activated by ionizing radiation to yield a tumor-localized high energy deposit and increased cell death compared to the same dose of RT alone. We report now the first phase II/III randomized clinical trial of NBTXR3 given as preoperative treatment to patients with locally advanced STS of the extremity and trunk wall. This trial met its primary and secondary endpoints of pCRR and R0 rates, respectively. NBTXR3 with RT demonstrated an acceptable safety profile compared to RT alone. 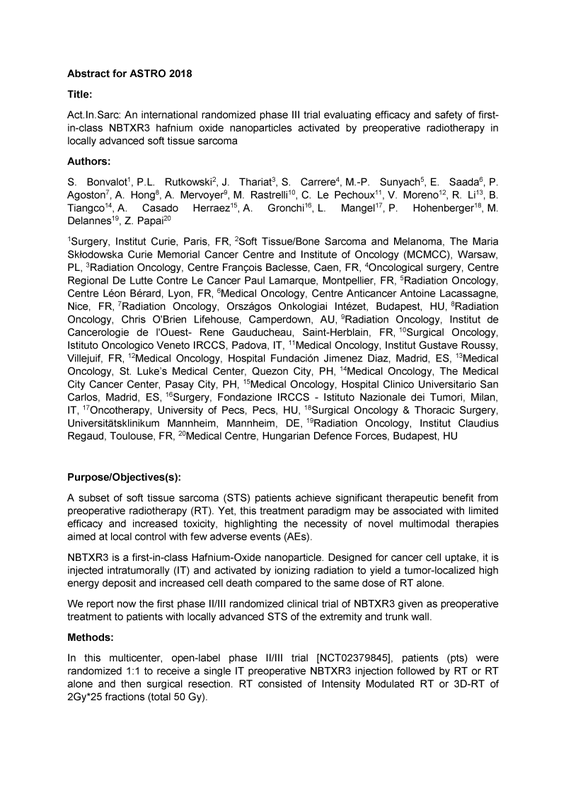 As pCR is a known indicator of long-term treatment response with a positive correlation to both progression free and overall survival, NBTXR3 represent a new option for preoperative treatment for locally advanced STS.